My wife is an amputee, the victim of a malicious cancer that destroyed the muscles in her left leg. For the past 9 years this has restricted her movements to places that she can maneuver on her forearm crutches. This has limited our previously active outdoor lifestyle, and our hiking is limited to short hikes on smooth trails or forest roads. Climbing through the timber, hiking to high mountain lakes, or similar activities that we once enjoyed are now relegated to the past. Fortunately we have always enjoyed canoeing and her physical limitations have not prevented her from sitting in the front of our canoe, and still being able to enjoy the beauty of nature. Despite my obvious addiction to everything involving fly-fishing it is a singular affliction and one not shared by my wife. Early on in our married life she made a few attempts at the sport, but the fishing bug never bite her very hard, and she has remained uninfected by the fly-fishing virus. After nearly 45 years I have little hope that she will ever succumb, however, when we go canoeing she insists that I take my fly rod in case there might be a chance for me to fish. One of our favorite lakes is a long narrow lake in the mountains near our home that was formed by a landslide several decades ago. Much of the lake is studded with dead standing timber, and the bottom is littered with the remains of fallen trees. Trout, some of them of considerable size, roam the lake, but they are hard to fool and even more difficult to land. The difficulty rests on several factors, and therein lays the challenge. Since it is a high mountain lake the hatches are limited to a very few insects. Midges provide the bulk of the biomass, and a few mayflies make up the balance of the waterborne insect population. The short summer season limits weed growth so damselflies are practically non-existent, there are not scuds or isopods, and the only major mayfly hatch is provided by Callibaetis. Some years they hatch in good numbers resulting in a fishable hatch that may last for most of the short summer, however, in most years the hatch is sparse and trickles along like a slowly dripping faucet. This always results in extreme frustration. The trout in the lake are notoriously sporadic risers unless the hatch is very heavy. 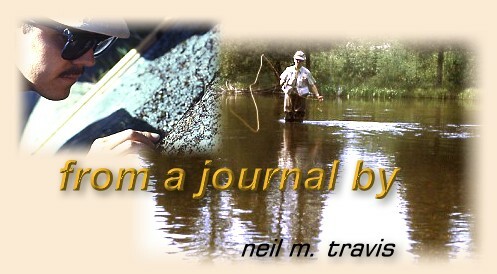 This makes dry fly fishing very difficult especially when you are fishing from a canoe. When a trout rises unless a cast can be made immediately any hope of success is greatly reduced. Two or three rises are normally the limit for trout in this lake, and 'gulpers' are very uncommon unless the bugs are very heavy. Unfortunately this is the exception rather than the rule. In my case we have added another factor, the need for me to control the canoe. This adds a whole new dimension to the situation.